On November 6, Eagle Rock Entertainment will issue "The Ritchie Blackmore Story" on DVD, Blu-ray, Digital Formats and a deluxe 2DVD+2CD edition. Without a doubt one of the all-time great guitar players, Ritchie Blackmore has always been one to let his music do the talking. In this documentary film, Blackmore has granted fans extraordinary access, resulting in a truly revealing, in-depth look into his life and career. 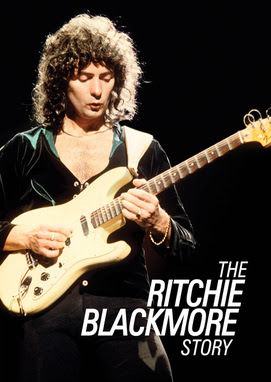 From his pop roots with THE OUTLAWS and his many session recordings in the '60s, through defining hard rock with DEEP PURPLE and RAINBOW in the '70s and '80s, to the renaissance rock of BLACKMORE'S NIGHT, Ritchie has proved that he is a master of the guitar across a multitude of styles. 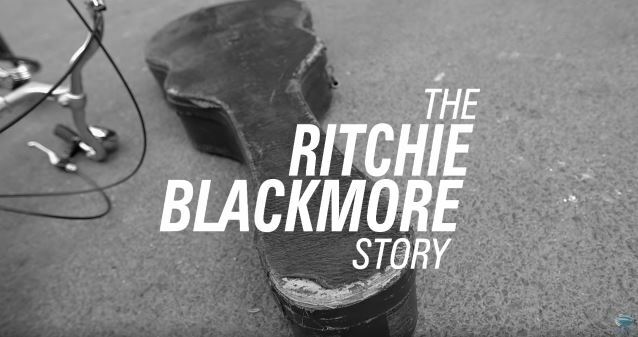 For the first time, "The Ritchie Blackmore Story" tells the story of his remarkable career through extensive specially recorded new interviews with Ritchie himself plus contributions from many of his colleagues and admirers, including Brian May, Glenn Hughes, Lars Ulrich, Steve Lukather, Joe Satriani, the late Jon Lord, David Coverdale, Gene Simmons, Joe Lynn Turner, Steve Vai, Graham Bonnet and Ian Anderson. The bonus features on this release offer up over 40 minutes of additional interviews with Ritchie Blackmore and his peers. The amazing Deluxe Edition contains the DVD of "The Ritchie Blackmore Story" in addition to the "Live In Tokyo" DVD and 2CDs, all contained in a 60 page 12" x 12" hardback photobook with a black and silver front cover. "Live In Tokyo" is the first official DVD and CD release of the 1984 concert by RAINBOW from Tokyo's famous Budokan. It was to be the last RAINBOW concert before Ritchie Blackmore and Roger Glover went on to reform DEEP PURPLE. "The Ritchie Blackmore Story" contains clips from many of his classic tracks with DEEP PURPLE, RAINBOW and BLACKMORE'S NIGHT, including "Smoke On The Water", "Highway Star", "Since You've Been Gone", "Wring That Neck", "Space Truckin'", "All Night Long", "Long Live Rock 'N' Roll", "Hush", "Black Night", "Child In Time", "Mistreated", "Burn", "Man On The Silver Mountain", "I Surrender", "Perfect Strangers", "Play Minstrel Play", "Renaissance Faire", "Fires At Midnight" and many more. Quite simply, "The Ritchie Blackmore Story" is a look into the life and career of the mysterious "Man in Black", an introspective look at a true guitar legend.